In aiming to create models of Truth/Reality that are consistent with the world of direct experience, scientists have now done something that the words in their scientific lexicon can't fully describe. They have shown that the experienced world is maintained by/supported by/generated from an unseen world. This unseen world manifests as the collective, human, experiential world in a lawful, stable, and consistent manner that, as our knowledge advances, is increasingly predictable, is independent of any individual's wishes and biases, and outlasts our deaths or lapses in consciousness. Thus, our fragile, unstable, fluctuating, personal experiential worlds are produced by (emanate from) an inconceivably huge, profoundly stable, foundational field of space/matter/time that manifests following its own rules or patterns of action, which we discern and call its "laws." When scientists try to understand the context in which our personal, experiential midworlds exist, they are forced to try to describe the cosmological macroscopic world of the stars, galaxies, gravity, black holes, light years, etc. They also must examine the fundamental, foundational microscopic world, the quantum world of nuclear forces, particles, and "strings." And when our midworld experiential language is used to try to encompass the findings of our study of either the macroscopic or microscopic worlds, we run into problems. Since our brains evolved for life in the midworld in which we must solve problems and engage in the activities of daily living, we find ourselves operating with midworld mental structures and constructions whenever we try to use our evolved brains to understand anything. So we end up creating models of these contextual worlds (the micro- and macroscopic worlds) using metaphorical models derived from our midworld experience. Yet, midworld metaphors inevitably breakdown when they are used to try to build models of realities they were not "designed for." That is, there was no selective pressure operating over the millions of years of evolution that shaped our brains to create brains capable of comprehending quantum physics, black holes, or travel at light speed. For example, when scientists look to the macroscopic, cosmological world of the stars, they have shown us an awesome immensity, a lawful world that is beyond the human capacity to imagine. Though we can use numbers to refer to it—e.g., the 14 billion-year-old universe is now 156 billion light years "in diameter" and is composed of 100 billion galaxies, each of which contains as many as 100 billion stars—these numbers just give us the illusion that we "understand" what we are talking about. Not only are the numbers so astronomical (no pun intended) as to be virtually meaningless, they actually describe an unimaginable universe full of paradoxical contradictions that our mind cannot encompass. (See the side box on "The Size of the Universe.") And, it is difficult to conceive or picture what one star (our own sun) really is, not to mention 10,000 billion billion suns. For an example of our limited ability to visualize what these numbers really refer to, try for a moment to grasp fully what we know about our own sun. Note: Most people can't pay attention when reading this kind of stuff. Why? They're not smart enough? No. Because, like "the size of the universe" question, it is hard to keep our midworld minds focused on metaphorical descriptions of micro- or macroscopic phenomena that have no fundamental meaning, i.e., that have no real connection to everyday, human life in the midworld of our experience. With this warning in mind, take a moment to see what happens when you try to "visualize" a familiar phenomenon that we take for granted, every day of our lives. Our sun contains 99.8% of the mass of our solar system (Jupiter contains most of the rest) and could fit 1.3 million earths within its volume. Pause for a moment just to think about that. It has often been noted that we live on a tiny speck of dust in some obscure edge of a galaxy that is itself a tiny dot of matter in a huge number of swirling galaxies spread out over unimaginable distances of intergalactic space. But if we stay within our own planetary system, we are confronted by equally astounding numbers. All life as we know it, all human hopes and dreams, all known living history of kings, poets, popes, emperors, romance, conquest, tragedy, hope, etc. etc. has taken place on a particle of matter that doesn't even comprise 1/10 of 1/10 of 1/10 of 1/10 of one percent of our own solar system! The Solar System is, in essence, one trifling pebble (Jupiter) and a whole bunch of insignificant scintillas stuck in gravitational orbits around one negligible thermonuclear ball. Now, recalling how minuscule our sun and our solar system are in comparison to the known universe, keep in mind that our mother earth, the only known life-containing world, is an itsy-bitsy teensy-weensy tiny speck of matter in our infinitesimally tiny solar system. click here for a higher res version with music; right-click to download. four million years of the total energy consumption of the United States, or of the entire world for one million years (based on energy consumption in the year 2001). So, every second or so, at its core, the sun releases the energy equal to any of the above. Count out loud: "One, one thousand." It just did it. It just did it again . . . and again . . . The distance between the earth and the most distant objects we can "see" is estimated to be about 14 billion light years. That's the distance light—which travels at 186,000 miles in a second—would travel in a full year at that rate, multiplied by 14 billion! But wait. The most distant objects are moving away from us. So after 14 billion years, we are really seeing them as and where they were 14 billion years ago. Today, they are much farther away. So, what is the diameter of the universe today? Well we can extrapolate from what we know about where they were, the speed at which they were moving away, the amount of time that has passed, and the overall expansion of the universe. What we come up with is an estimated actual distance of 78 billion light years for the most distant objects (that appear to be 14 billion light years away today) and a current diameter estimate for the universe of 156 billion light years. "But wait!" you cry. "How can that be? We are told that the Church was wrong; the earth is NOT at the center of the universe. So why should we double the distance to the most distant objects to get the diameter, as if we are at the center?" Ah, silly you. You must have forgotten to take into consideration the implications of our incomprehensible relativity theories, which tell us that ANY point can be taken as the center of the universe. Using sentences like the preceding one (that make fundamentally unintelligible but superficially simple claims) and simple analogies, we can pretend we actually have some understanding of relativity. For examples, consider the balloon and raisin bread universe analogies. In the balloon analogy, the galaxies are like dots on the surface of a balloon that are all moving away from one another at equal speed as the balloon is blown up. It doesn't matter what spot you select on the balloon; all the other dots around it are moving away from it at the same rate of speed as from any other spot. And then there is the Raisin Bread Universe in which the galaxies are the raisins in the dough (space). As the bread is allowed to rise, all the raisins move away from the other nearby raisins at the same speed. The doughniverse is expanding; using these analogies, for a moment we can pretend that we can truly visualize (understand) the implications of relativity. But the analogies fundamentally break down. For example, "Wait!" you cry again. "How can that be? We are told that nothing can travel faster than the speed of light. How can we be 78 billion light years away from objects that were 14 billion light years away from where we are now 14 billion years ago? Even at the speed of light, they could only be 14 billion light years further away today, or a maximum of 28 billion light years." Relativity to the rescue again. You see, the distant galaxies are not only moving away from us through space, space itself is expanding. So the apparent change in distance is a product of the speed of the two objects' motion through space PLUS the expansion of space itself, what has been called the comoving distance. There. No violation of relativity. The distant objects are moving at speeds considerably slower than the speed of light. It is only with the additional effect of space expansion that they appear to be moving faster than light. All this would be well and good if it made any sense; that is, if it didn't produce more paradoxes than the questions it answers. But consider this: We only have one way of understanding "speed." Speed is the change in distance between two objects over a certain period of time. What is the difference then between two objects moving away from each other through space PLUS the expansion of space itself—which can also only be known by the change in the distance between objects—vs the speed at which a distant object is moving away from us? Space has no fixed coordinates. So, what does "moving through space" mean without reference to motion relative to other objects in space? Remember that relativity theory tells us that motion can only be detected (be defined by, have any referential meaning, etc.) in relation to other objects. So, if the distance between two objects is increasing faster than the speed of light, isn't one moving away from the other faster than light? If not, what do we mean by "moving?" This is partly why some people consider the comoving distance to be a merely theoretical concept with no physical meaning. Yet, without the comoving distance, many theorists think the Big Bang model collapses. And to complicate matters further, how can we measure the diameter of something that is infinite and of unknown shape? Space, we are told, has no end and "curves back on itself." As on the surface of our expanding balloon, if you go in a straight line, you will eventually return to where you began. And the distribution of galaxies in the universe may be roughly sphere shaped, like a balloon. So far, the balloon analogy is holding up, if you agree to stay on the surface of the balloon. But what if you were to travel through the center of the sphere directly to the most distant objects on the other side? If you kept going, what would be the shape of the ballooniverse that would bring you back to where you began? It takes the energy produced in the sun's core one million years to reach the surface of the sun, at which point some of it is emitted into space. Every second, the earth is bathed in less than one half-billionth of the energy that was created in the sun's core one million years and 8 1/2 minutes (or so) ago. This teensy portion of the energy emitted by our sun is almost the entire source of all the energy and warmth on our planet, including what we get from fossil fuels, burning wood/organic material, hydroelectric, wind energy, as well as the energy from the food we and other living organisms consume. That is, almost all movement (living and non-living) that we perceive of anything or any being on our planet is derived from this infinitesimal portion of the energy that comes from the sun. Yet, the sun emits more than enough energy into space to warm more than 2.2 billion earths. And our galaxy contains 100 billion suns and is so huge it would take billions of years for a a non-stop jet plane to reach its center. Furthermore, our unimaginably huge galaxy—composed of an unimaginable number of unimaginably huge suns—is just a tiny speck in a sea of more than an equally unimaginable number of galaxies! At the other end of the size scale, we have the equally incomprehensible, microscopic, Alice in Wonderland world of quantum physics. 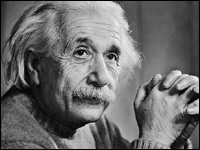 These quotations from famous physicists are not out of context exaggerations. Quantum physics is fundamentally paradoxical. Physicists have now given up on "visualization," in which the expectation was that we could hold a mental model of the world in our mind's eye and have a sense that our scientific theories are "intelligible." Indeed, some would even say that quantum physics has done away with the notion of any reality that exists without an observer. While Haldane was not a physicist—he was a great evolutionary biologist—we suspect that he was aware of the fundamental paradoxes of modern physics when he reflected on the limits of the evolved human psyche: Our brains were not designed to comprehend the fundamental structure of the universe. Reality is queerer than our brains—that were largely "designed" by the selective pressures created by the material realities and social vicissitudes of tribal, midworld life—are capable of imagining. Thus, the scientists have now described a lawful, inviolate, unvisualizable (i.e., not directly knowable through either sensory experience or mental image/models) quantum-relativity-field of mass-energy-space-time that generates the unimaginably immense known (i.e., experienced) world. Among its other myriad forms, this unknowable world manifests as life and has taken on the form (i.e., evolved into) what we call "humans." Our nervous systems—which like all matter, are also composed of unseen, invisible, and unvisualizable particles and forces—interact with the rest of the unseen quantum relativity world of matter-force-space-time to generate our world of experience. Thus, all we know and experience is generated from, arises from this invisible world that Einstein called "The Universal Field." The midworld of our direct experience—what we call Reality—is thus "created" in our brains/psyches as our evolved nervous systems interact with something fundamentally unintelligible (the quantum/relativistic macro- and mircroworlds) that lies beyond (outside of, provides the context for, is the source of) our experiential world. In Indian philosophy, the Upanishads — also known as the Vedanta or the culmination of the Vedic wisdom — are, in essence, a series of poetic expressions describing mystical experiences. In these mystical poems, something remarkably similar to Yo, the Divine Mystery, and the Tao is described. He said: “That, O Gargi, Brahmans call the Imperishable (Aksara). . . . Verily, O Gargi, he who departs from this world without knowing that Imperishable is pitiable. But, O Gargi, he who departs from this world knowing that Imperishable is Brahman. “These rivers, my dear son, flow—the eastern toward the east and the western toward the west. They arise from the sea and flow into the sea. Just as these rivers, while they are in the sea, do not know: ‘I am this river’ or ‘I am that river.’ Even so, my dear, all creatures, though they have come from Pure Being, do not know that they have come from Pure Being. Whatever these creatures are in this world — whether tiger, or lion, or wolf, or boar, or worm, or fly, or gnat, or mosquito, that they become. The Mundaka Upanishad: What is that timeless thing, that which is called Imperishable? “That which is not capable of perception through the eyes, that which cannot be grasped with a hand, that which has no origin, that which has no shape or form, that which has no sense organs like us, that which has no limbs such as feet, hands, that which is permanent, eternal, all-pervading, subtler than the subtlest, that which is imperishable, that It is which the wise regard as the source of all beings. There is an indefinable mysterious power that pervades everything, I feel It though I do not see It. It is this unseen power which makes Itself felt and yet defies all proof, because It is so unlike all that I perceive through my senses. It transcends the senses. But it is possible to reason out the existence of God to a limited extent. Even in ordinary affairs we know that people do not know who rules or why and how he rules and yet they know that there is a power that certainly rules. In my tour last year in Mysore, I met many poor villagers and I found upon inquiry that they did not know who ruled Mysore. ... If the knowledge of these poor people was so limited about their ruler, I who am infinitely lesser in respect to God than they to their ruler need not be surprised if I do not realize the presence of God — the King of Kings. Nevertheless, I do feel, as the poor villagers felt about Mysore, that there is orderliness in the universe, there is an unalterable law governing everything and every being that exists or lives. ... That law then which governs all life is God. Law and the law-giver are one. I may not deny the law or the law-giver because I know so little about It ... Just as my denial or ignorance of the existence of an earthly power will avail me nothing even so my denial of God and [Yos] law will not liberate me from Its operation ... I do dimly perceive that whilst everything around me is ever changing, ever dying, there is underlying all that change a ... power that is changeless, that holds all together, that creates, dissolves and recreates. That informing power of spirit is God, and since nothing else that I see merely through the senses can or will persist, It alone is. Or to put it another way Truth is God. This Truth ... is that which alone is, which constitutes the stuff of which all things are made, which subsists by virtue of its own power, which is not supported by anything else but supports everything that exists. Truth alone is eternal, everything else is momentary. It need not assume shape or form. ... We call It [God] because everything is regulated by Its will. It and the law It promulgates are one. ... It governs the entire universe. The Tao that can be known is not Tao. "The substance of the World" is only a name for Tao. The World is only a map of what exists and may exist. And experiences with Self to understand the World. They are distinct only within the World. Which is infinitely greater and more subtle than the World. Like the poetry of the Tao Te Ching and the mystical notions described in the Upanishads, modern science now provides us with metaphorical "descriptions" of the awesome mysterious phenomenon we refer to with the placeholder, "Yo." Some feel that this is also a description of something beyond the experienced world that could reasonably be labeled "God" (without any of the connotations derived from magical thinking, anthropomorphic projection, and wish fulfilling, fictionalized stories of creation). In order to avoid the confusion introduced by using a word laden with illusions and misleading connotations, we use Yo to refer to this mysterious marvel. One could insist, however, on refering to this paradoxical marvel with the word "God," and also attempt to make its meaning consistent with our actual experience of Reality. In this case, could there be a better definition of God than the following? An unimaginably immense, incomprehensibly unintelligible, fundamentally unvisualizable field that created itself—or has existed throughout all time without creation—and that lawfully generates (manifests or brings into existence) the universe that we experience. God—or rather, Yo—the Unknowable Foundation/Source/Generator/Maintainer of the Known/Experienced World exists. So what does that mean to me, why is that important? If Yo is the universe, then isn't Yo just another word for everything?